You know that architects think there is much to criticize about a design when they don’t want to actually show you the design. Case in point: The recent Rudin/St. 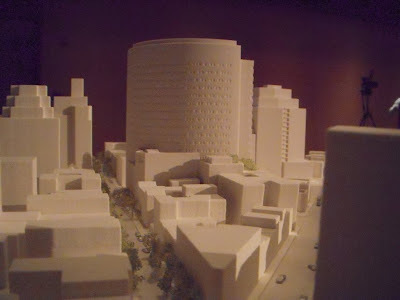 Vincent’s real estate deal will make a lot of money for the developer Rudin and for St. Vincent’s Hospital by selling off a portion of the Greenwich Village Historic District in order to substitute much larger-scale buildings. One of those huge buildings is a new hospital building of a scale the architects probably feared the public would find frightening. 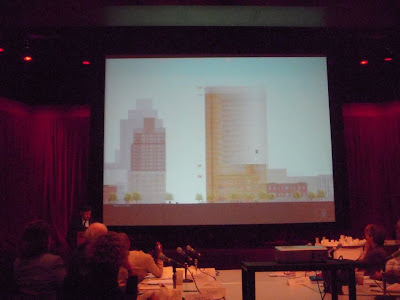 Accordingly the rendering presented the building as a ghost building fading out to non-existence on one side. 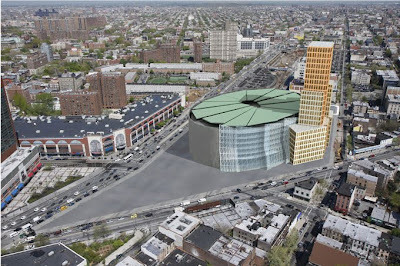 Now we have the renderings for the recent redesign of the Atlantic Yards arena. It’s the third design for the arena. You can tell how eager the developer was (not!) for the public to see it by the fact that the design wasn’t released until just after ESDC closed its period for public comment. Here though is what we find to be the most fascinating element of the rendering which also convinces us that they don’t want the public to really see the design even now: Fifty percent of the colored rendering of the arena is not a rendering of the arena at all. 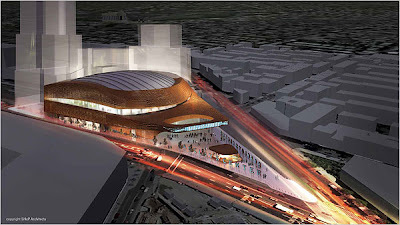 It is a rendering which, borrowing the same colors in which the arena is depicted, shows with abnormal emphasis the blurred lights of the passing traffic on Atlantic and Flatbush Avenues! Gosh Golly! The lights of the passing traffic are going to be prettier than the arena itself? What is the rendering trying to hide? One thing it seems intent on hiding is the relative scale of the arena. The huge blurred light streams in which the arena is couched seem to serve as a comfortable large-scale reference point diminishing the scale of the arena itself. Showing the detail of individual cars and trucks with their relative minutiae would instead provide a contrast and scale (and might make the serious traffic and security issues being discussed less abstract). The blurry hologramatic effect of the lights floating in space around the arena also distracts from the similar now-you-see-it-now-you-don’t floating light boxes that stand in for more of the mega-project that is not in fact designed at this point. 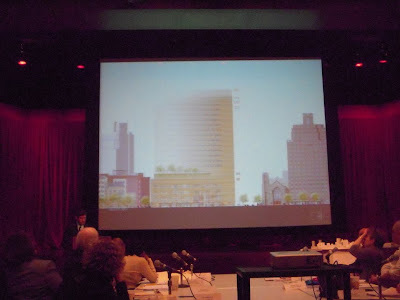 Were these phantom light boxes (Neil de Mause of Field of Schemes calls them "vaportecture") made more obvious by having to stand alone in the rendering it would likely remind the public that the rest of the mega-project, including its housing components, is not truly promised and is far from assured. At best, it will probably be many years or even decades before any of the “vaportecture” materializes as anything real, solid or defined. It wouldn’t be good for the public to look and see just an arena standing starkly alone because the arena is an acknowledged net loss for the public. The just-released city Independent Budget Office calculates the net loss to the city at $220 million ($39.5 million in direct losses and $180.5 million on opportunity losses) while it calculates the boondoggle subsidies to the developer at $726 million. 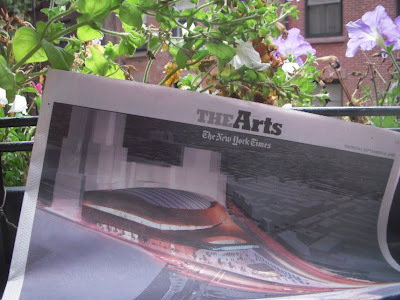 (See: Thursday, September 10, 2009, Net gain to Ratner, loss to public: IBO says developer saves $726M on arena; city loses $40M plus another $180M in opportunity costs.) We think that the Independent Budget Office may have underestimated the total boondoggle subsidies to the developer (for just the arena) though the figure they have come up with is now getting close to our own of a while ago. The rendering is another of those architectural presentations that play tricks with light. Many architectural renderings show buildings at twilight in order to emphasize what lighting can do for the depicted buildings, offering a bit of a scale-diminishing translucent effect not available at other times of the day. In this particular rendering, while the arena is lit up and while “speeding” traffic and other portions of the undesigned project float to contribute to the overall translucent effect, the rest of the neighborhood is depicted as dark, as if everyone had turned off their lights and abandoned the neighborhood for good. That sort of goes along with the fiction the developer would have people believe, that nobody lives where they want to take land for the project. 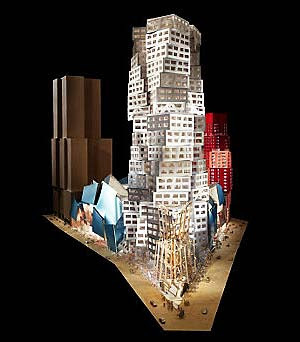 Eliminating the lights in the existing buildings also disguises the significant difference in scale. This is not the first time the developer has put the arena in light and made the rest of the neighborhood go away by putting it in the dark. 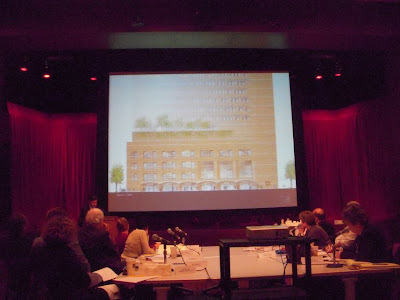 The developer has never wanted to show its project in the context of the surrounding neighborhoods. For a bleak light-of-day depiction that better reveals the interrelationship of project and neighborhood scale and acknowledges that not much other than the arena may be built, we recommend the Atlantic Lots renderings done by the Municipal Art Society. These are particularly clear for the way that they show the scale, conveying details of the traffic and surrounding buildings. So that leaves us thinking again of the oddity of how the project has been surrounded in a glow of that feigned time-lapse photography of speeding traffic. It seems to us that, in this case the lipstick has been applied in a big blurry smear.